How long have you been dancing? Dancing since 2000 off and on. Much more on than off. 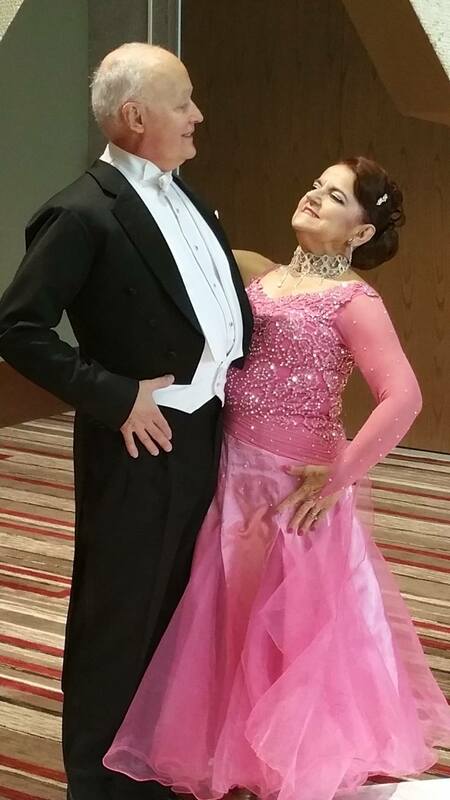 How did you get into ballroom? Purchased Don 3 dance lessons for Christmas. Which dance do you enjoy the most? Enjoy which ever dance I seem to be doing best at any time. Tango, V. Waltz, and Foxtrot. What is your favorite dance memory? Tango with Don. Filled in for Maria. More recently enjoyed the Ohio Star Ball. What dance goal would you like to conquer next? Foxtrot Routine. What are your other hobbies? Traveling, Bicycling, Swimming, and studying languages. Currently forgetting Spanish learned last fall as I review French learned in high school. Tell us something you think most people don’t know about you. Worked in a Kinderklinik in Germany in for 1 year.